Trees need rain, but how much rain is too much? We all know that for trees to survive they need the moisture that comes from rain. The amount of rain we have been getting lately, however, might actually be too much and killing our trees rather than helping them. Too much rain can actually be damaging to a trees metabolic process. 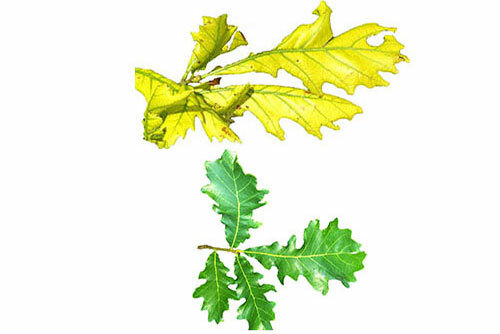 These symptoms may indicate a nutrient deficiency in the tree. Proper nutrients are vital for trees to be able to live and thrive. Some Micro nutrients that trees need to survive are iron, manganese, zinc, copper, boron, chlorine, and molybdenum. D & J Arborists can evaluate and give your tree the nutrients it needs through micro nutrient injections and deep root fertilization. Some trees more at risk are the Sweet Gum, and the Oak tree family. Call for an evaluation if your tree is showing these symptoms before it’s too late. The top leaves show Iron Chlorosis while the bottom leaves are normal, healthy leaves.